We are an unbeatable team! Praise God, just as this issue was going to press, the last $100 that was lacking for our emergency mortgage payoff was given by you! The entire $50,000 is now either paid or clearing in the bank! Thank you for your prayers and gifts! ELVIE TAKES A BREAK AS SPEAKER AT A LADIES' CONFERENCE. SHE DEMONSTRATES THE NEW DIGITAL CAMERA DONATED TO OUR MINISTRY. CABINETS (6): $17 each GYM FLOOR: PAID! "Kristohanon Pagpakabana." (Christians, be aware). Little Hannalyn sang with her 2 sisters, accompanied by their dad on guitar. 1,000 pastors & believers at a beachside combined baptismal service gave them a standing ovation at the end of the song. This family, involved in church & school, is always full of smiles, with one exception...testimony time. When the mom gives her testimony, she's in tears. Every testimony tells the joy they've experienced as believers. Before they were Christians, both the mom and dad were alcoholics. The dad worked all day at the rice mill, and was paid for his work with a small bag of rice. When he got home, the rice for his family was less, due to his stopping to drink on the way. The mom got so frustrated that once he got home, she'd go to the bar herself and drink the rest of their income away. The kids were starving. Then a pastor came to their Ata tribe and told them about Jesus. They became Christians. Now, the husband works in our school as a carpenter, and the wife helps as a janitor. Their smiles and songs brighten our days! "Believe in something larger than yourself." Four years ago in 1999, Col. & Mrs. Garcia, along with Elvie & I, sat down with our lawyer and designed a "rent-to-own" open-ended contract to purchase their property for us to build a school on. The total price of the land and 2-story house was $50,000. The contract's agreement was to pay $250 each month, with one balloon payment in 2000, and the remaining balance in 2002. A clause in the contract stated that, should the final balance not be available in February of 2002, an additional 1% per month would be added to the remaining principle until paid in full. However, when we presented our final amortization schedule to the Garcias, to be paid in full by December of 2002, they were incensed, and demanded that we pay it in full by July 1. Although we could have taken the Garcias to court over this reneging of the contract's emergency clause, we determined that it might not be a good idea, since Col. Garcia is the chief of police for Davao City. Three miracles were needed, one on each of these three days. Because you prayed, God gave us our second miracle when a wonderful woman in her 80's (who will remain anonymous) sold her mobile home and gave us $2,000 from her proceeds! Yet now we are racing against time for the third miracle, on June 30. Already there have been gifts, both large and small. But pray, as the funds need to clear in time. It's been three years since our last furlough, and we're now planning on being in the USA from June'2003-April of 2004. Would you like for us to visit your church? Please contact Bud Barner for available times, at budbarner@juno.com. 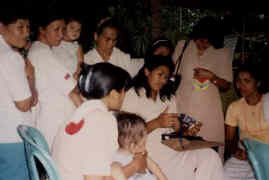 Martin Burnham, missionary pilot with New Tribes Mission here in the Philippines, and his wife were kidnapped last year. In a gunfight June 7 between the Philippine Military & the terrorists, Martin was killed. His wife Gracia is now in Kansas with their kids. Welcome home, Gracia! Welcome HOME, Martin!